NOTE FROM THE EDITOR: The following article consists of the “Literary Event” personal opinion reflections/reviews from the Fall 2017 students of Professor D’Aries’ WRT 377W-01 course, The Writing Life. The editor has elected to make the minimum amount of edits in the attempt to preserve originality. Otherwise, reflections were written and published by the members of the class on BlackBoard. To start off the article, D’Aries’ BlackBoard reminder for the assignment is posted first. The reason that this particular class’ reviews of Dr. Alvaro Fernando Rodrigues-da Cunha’s lecture, Indigenous Tribes and Languages of the Amazon Rainforest, on October 10th, are being published is because The Echo’s Editor-in-Chief/President, Alyssa/Lulu Meyers and Vice President, Sophia/Sophie Pizzo, are members of this class, and were subject to attend and review this event. In an act of community and togetherness, Meyers prompted the opportunity to put our required attendance to a more informal use. As I mentioned in class, we will attend this lecture on Thursday, October 5th at 1:40 in the Student Center Theater: http://www.wcsu.edu/news/2017/09/28/amazon-indigenous-tribes-expert-to-speak-at-wcsu/. We will meet at the lecture, so be sure to come see me so I can mark you present. Before class on Tuesday, 10/10, post a 250-word response to the lecture in this forum. This response will be similar to our reader responses in that I’m most interested in your analysis and critique rather than a summary. Be sure to include at least two quotes from the speaker. 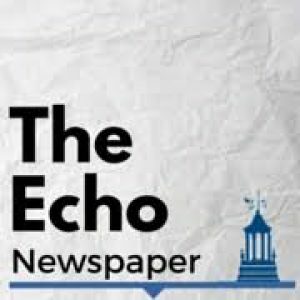 And as Alyssa mentioned in class, anyone interested in contributing their response to a feature article in The Echo should contact her directly. Dr. Alvaro Fernando Rodrigues’ lecture on indigenous tribes and languages of the Amazon rainforest was both fascinating and quite enjoyable. He talked about population numbers and numbers of languages. The videos he showed were peculiar but interesting to watch. They certainly had more information on them then I was expecting. I knew tribes like that existed and they are in need of help from the outside world, for food and proper medicine, but I was mostly under the notion that they were striving to preserve their way of life, without being kicked out by illegal foresters/minors or dying for their lack of food, medicine, and dangers of the jungle. Dr. Rodrigues didn’t really say anything about preservation, but I think it was intended when he said they needed help. All people are people, but because of where they live, they grow to think differently, communicate differently, and just live differently than people in other places. “Human beings are all the same. Same hardware, but different software.” We’re built the same but wired a different way. And people like him wish to understand exactly how they are wired. “Each language holds information on the people who speak it.” And Dr. Rodrigues this information is well worth learning and understanding. That is why he does what he does. And he seems very passionate about it. When he said that he had only been speaking English for no longer than a year, I was very surprised. His English isn’t perfect, but for someone like me, who has major difficulty learning a new language and remembering, that is quite impressive. My personal favorite part was towards the end when he showed us the translation of a few English words into a few different languages indigenous to the Amazon tribes. I liked echoing his pronunciation of the words. If living in a rain forest means no unnecessary mass shootings and worrying less about what people think about you, then point me in the direction. I enjoyed Dr. Cunha’s lecture on indigenous tribes for the simple fact that it’s based on an appreciation for language and culture. Sometimes we get so embroiled in our own worlds that we forget to appreciate the small things, and I get the sense that in these tribes, they appreciate everything despite having little food and no health care and that just so happens to be their two major necessities. So I loved it when he said that everything is about nature in the Amazon rainforest while in America it’s all about money. I could agree; it’s all about money and power. What if we could live like the indigenous for a week? It takes something like that for some of us to really appreciate what we have, like a bed and hot water. Another part of the lecture that stuck out was when he said that between us and the indigenous tribes we have the same hardware (feelings, bodily needs) and a different software (he speaks one language, I speak another). No matter where you’re from, we have this common link: a need to survive. Also, the roles of females and males are similar. Women take care of the home and the men work outside the home; they hunt. We’re all just trying to survive. What also stood out to me, and most likely to everyone else, was the video of the young man wearing the bullet ant gloves, per ritual. I found it intriguing; painful to watch but intriguing, considering that’s what it takes for a boy to become a man, and it makes him a better man too. The fact that this young man never complained made me feel like a total wimp for having complained all throughout my service in the army. Again, I really liked listening to Dr. Cunha. I hope to attend another lecture in this series. Dr. Alvaro Fernando Rodrigues-da-Cunha presented, with exceptional enthusiasm, a look into the lives of various indigenous tribes. Having spent four years living among a few different tribes, Dr. Rodrigues-da-Cunha has vital information on the communication, survival and cultural aspects of living in the Amazon rainforest. One concept that Dr. Rodrigues-da-Cunha repeated is “we have the same hardware, but different software.” We may look the same or very similar, but we have vastly different perspectives and ways of thinking. It was interesting to learn that there are so many indigenous people in the world. It is insane to think that 69 tribes do not have any contact with the outside world. It is also sad to know that they need protection from governments that do not even admit they exist. Another concept that Dr. Rodrigues-da-Cunha made clear is that living in the rainforest is hard. He admitted that he had trouble adapting to the diet and even lost three teeth while there. I cannot imagine living in a place where food was not guaranteed and dental hygiene was not certain. He mentioned that the indigenous people depend on nature the way we depend on money. I think sometimes we need to be reminded of the luxuries we benefit from here. I have to say that presentation was very exciting to listen to. The Professor who presented was one of the most eccentric and interesting people I’ve heard talk before. I knew of the Amazonas region from watching an episode of Chef’s Table on Netflix, wherein an ex-hippie acid head decided to become a chef and now runs one of the top 10 restaurants on the planet. It seems that everyone to come out of that area, in my limited two-example experience, is a wild tree person to which everything is “amazing, trust me.” Hearing about indigenous peoples in trouble always irks me. These cultures, as archaic and primitive as they are, are really beautiful and should be treated with respect. The entire foundation of our civilization can be traced back to people like this, and in typical modern human fashion, we exploit them and destroy their homeland for our own gain. The language discussion was cool in of itself, but still, I am always drawn to the fact that I wish they would just take care of these people. The Brazilian government, in some cases, refuses to acknowledge their existence so that they can continue to log the forests. Maybe I’m just a hippie in this sense, but I’m not sure. It seems pretty straightforward to me that these people should be cherished and kept safe for as long as we can. If it all comes down, my money would be on them to make it through, not any of us modern folk. Learning about indigenous tribes/cultures in the Amazon was quite interesting, to say the least. The guest speaker was incredibly intelligent with his research and very informative. I was also amazed at how quickly he learned our English language so quickly in just one year, after spending the first four years of his life in the rainforest. This experience overall made me really appreciate the American way of life, and not to take the small simple things for granted. Thus, it seems as if the tribes that reside in the Amazon almost thrive on what little resources they can harvest. By this is mean they pretty much make do with what they have and seem relatively happy to live the life they do. Seeing such scarce conditions, however, made me sad because if members of the tribe become ill they do not have the proper treatments to cure the specific illness that can rapidly spread ending up fatal for most. Further, although he greatly appreciates the culture he came from, which is completely respectable and understandable, I question the thoughts of him saying he could adapt back to that lifestyle. Finally, the two quotes or two statements that stood out to me throughout the whole presentation were the following: ” A life without suffering is a life that is not worth living.” (in regard to the coming of age ceremony for becoming a man). Also in correlation with that painful ceremony, “The Amazon tribe Satere Mawe the young males wear gloves filled with hundreds of bullet ants.” Watching the short video clip of this experience, was even painful for me to watch, justifiably cringeworthy! Dr. Rodrigues’ lecture on the Amazon Indigenous tribes was very interesting. While I’ve heard and studied very few indigenous tribes in a few anthropology Dr. Rodrigues shared a lot of new information. For example, he shared with us a lot of numbers when it came to population and the number or tribes and languages. It was shocking to find out that at one point in time there were at least 6 million indigenous people living in Brazil, it was even more shocking to find out that as of today there are less than 900,000 indigenous people. While this is an understandable fact as Rodrigues shared with us that as many as 69 tribes have never had any sort of outside contact with the world around them. So much so that when these tribes do come into contact with others it is almost impossible to communicate with them. He further explained that many of these tribes are trying to ask for help as they do not have access to basic human necessities such as food, clean drinking water, and medicine. Dr. Rodrigues shared with us that the lifespan for many of the indigenous people is between 40-50yrs old. Learning this amazed me simply because in America 40-50 years of age is still considered to be quite young. Overall the lecture was very interesting and I learned a lot. Overall, I thought the lecture was boring. The speaker had interesting things to say, and I enjoyed the videos that he showed the audience throughout his presentation, but when he was just talking to himself I couldn’t help but wonder how much longer I would have to sit there until the speech was over. I don’t think this is the speaker’s fault, exactly, because he was clearly passionate about what he was talking about. Maybe I just wasn’t as invested because he wasn’t talking about aspects of these tribes that I was interested in. Yes, the languages they speak are important but I found myself being more drawn to the social dynamics and gender differences. I was interested in what the men of different tribes used to cover their penises and how even though they live life naked the women still sit in a way that hides their vaginas from view. I was interested in the fact that, despite having minimal contact with other kinds of people, the tribes’ women still fall into basic gender role stereotypes that we see in our own society: the men go out and the women stay home to cook and care for the children. Some things really just don’t change in the world, huh? The bit at the end when the speaker had some words in the tribes’ languages up on slides for us to repeat was amusing for the time that we did it, but I can’t say I remember anything about it besides laughing at myself for butchering the pronunciation. Maybe this lecture just wasn’t for me. On Thursday, Oct 5, I attended the lecture on “Indigenous Tribes and Languages from the Amazon Rainforest” presented by WCSU World Language Professor, Linguist, and Anthropologist Dr. Alvaro Fernando da Cunha. The lecture was captivating, soul-wrenching, and thought-provoking. The indigenous tribes are in danger and close to extinguishing. Dr. Fernando da Cunha explained why, with personal stories, images, videos, and facts. The professor stressed the commonality of internal emotions between these untarnished tribes of the Amazon, and human beings throughout the world. All humans feel. He then explained the daily struggle to survive within nature, and the survival techniques used with the utilization of medicinal plants, natural fibers, and skills necessary to live near a river, or a mountain. Survival within a specific habitat has been learned and mastered through a lineage of multi-generational adaptation. Longevity and survival within the rainforest will, at best, reach fifty years. Malaria, other diseases, malnutrition, and parasites shorten the lifespan. The domestic and hunting tasks within the tribes adhere to the male-hunter, and female- child tending and home keeping chores paralleling the anthropological patterns of Homo-Sapiens, and other early prehistoric tribes. Task responsibilities and chores within the tribes are viewed equally, without a gender directed dominance. Women determine male sexual partners. In this realm, the women have more control. A final portion of the lecture focused on the spoken languages. There are 305 indigenous ethnicities, and 274 indigenous languages in Brazil. From those 274 indigenous languages, there are many variations amongst the different tribes. I appreciated the storytelling narrative of Dr. Fernando da Cunha. He was sharing his personal story of living amongst these people and passionately invoking audience members to share in the study of these special tribespeople that have lived apart of an electronic- frenzied society that rarely, or barely has the time or opportunity to stop and see the natural world. On October 5th, Western’s departments of World Languages and Literature (WILL), History, and Social Sciences hosted Dr. Alvaro Rodrigues-da-Cunha, of the University of Sao Paulo and University of Campinas in Sao Paulo, Brazil, and a post-doctoral researcher of anthropology and linguistics as they pertain to the native peoples of the Amazon Rainforest. Dr. Rodrigues spoke at WCSU’s Midtown campus Student Center Theater, delivering a lecture titled “Indigenous Tribes and Languages of the Amazon Rainforest”. Dr. Rodrigues, a lively speaker who engaged his audience with fervor and friendliness, spoke of the great cultural diversity both endemic to the Amazon and present, through centuries of colonization and cultural exchange, throughout the nation of Brazil—the largest country in South America, which contains most of the Amazon, and houses most of its tribes. He also spoke of the continued fragmentation of these cultures. While European colonization, which began in the late 1400s, represented the initial, and perhaps largest overall, disruption to the forest’s tribes, today most indigenous Amazonians are threatened by the dual presence of loggers and drug smugglers, as well as global warming. These are serious problems for groups of people already beleaguered by the hostile environment of the forest itself, most Amazonian natives already living lives much shorter, on average, than those of first-world people. Yet, as Dr. Rodrigues was quick to point out, the indigenous peoples of the Amazon are just as human, and so just as deserving of respect and dignity, as we are here, in a technologically-advanced society. Indeed, we have the same basic necessities despite our cultural differences, a glaring fact which continues to be ignored by those who persist in destroying the Amazon. I think he put it well when he said, “We have the same hardware and different software.” In other words, we have the same bodies and brains, but different ways of carrying out our lives. Regardless, for many of the tribes of the Amazon, the primary struggle—one existential in nature—is that of basically defenseless peoples, most without any weapons other than bows and clubs, having to defend themselves against encroaching loggers, remorseless forces acting on behalf of large, greed-driven organizations. In the process, many distinct languages, spoken nowhere else in the world, have perished along with the tribes. As Dr. Rodrigues stated, “Each language holds the unique reality and knowledge of those who speak it.” If that’s the case, then we have lost many realities, and countless amounts of knowledge, since the arrival of Europeans to the shores of the Americas. So, if we wish to preserve the unique wisdom of the peoples of the Amazon Rainforest, then we had better work to preserve the languages of those peoples; thus we must protect those people themselves, and the forest that they call home. “Amazing,” is an adjective and exclamation that the presenter continuously used throughout his presentation. “Amazing,” is how I will describe my experience attending this lecture on Indigenous People in in the Amazon Rainforest. While the presentation itself was fascinating, I found the presenter’s passion and energy thrilling. His obvious interest and investment (which I was not surprised, but excited to discover is something intimately important to him) drew me in more than anything else. He wanted us to see what he saw, to understand what he felt and saw. Instead of putting the information before us and hoping that a few words on a PowerPoint would be enough to absorb his lecture, he made us – or, at least he made me – feel involved and included as if we were part of the presentation; part of the presenting. He told us, in regard to all human beings, that, “we have the same – the same – hardware, but we have different software. Yeah, [it] is amazing. The same hardware – necessities, emotions… There’s no difference about them and us. There’s none.” It would have been simple to say that we are the same and leave it at that, but he kept making a point to repeat it and make the thought stuck. At first, during the first few times when he would refer back to this concept, I would think about how I, personally, could understand it. I have heard similar things, about all of us humans being the same, and sometimes I would be able to grasp the concept, but rarely would I ever feel it. It is my belief that the presenter put a lot of thought, passion, effort, and feeling into conveying and promoting this – for lack of a better word – vibe. Eventually, I think I started to feel it, or at least feel and/or empathize with his feeling of this connectivity, unity, whatever it was that hit and stuck with me. Oh, and I want that magic tea that prevents period pains, please and thank you. To me, the most memorable and impactful part of this lecture was the presenter himself. Right from the beginning of the presentation, Dr. Alvaro Fernando Rodriguez-da-Cuma was enthusiastic and radiating positive energy. He expressed his hope that students in the crowd, in five or ten years, would take his place on the stage, presenting their own lectures and research. It was refreshing to attend a lecture with such an enthusiastic presenter– it was evident that Dr. Rodriguez-da-Cuma has a passion for the Amazonian tribes. At face-value, the lives of the indigenous Amazonian tribes are such a polar opposite from what we consider to be modern/”advanced” society. Watching the first video of indigenous tribe members making contact with more “modern” people was interesting. As people living in what we consider to be modern times, our exposure to people living in nature or without technology is usually through history textbooks or documentaries. We forget that these tribes are still existing and thriving and that they are living cultures. That’s why I found Dr. Rodriguez-da-Cuma’s work so profound– he is dedicated to making sure that these people and their languages are not forgotten, even when the rest of the world likes to pretend that they don’t exist. My biggest takeaway from the presentation, ultimately, was the phrase Dr. Rodriguez-da-Cuma repeated several times: “We have the same hardware, but different software.” Even throughout cultures that are so vastly different, we are all humans trying to meet the same needs.